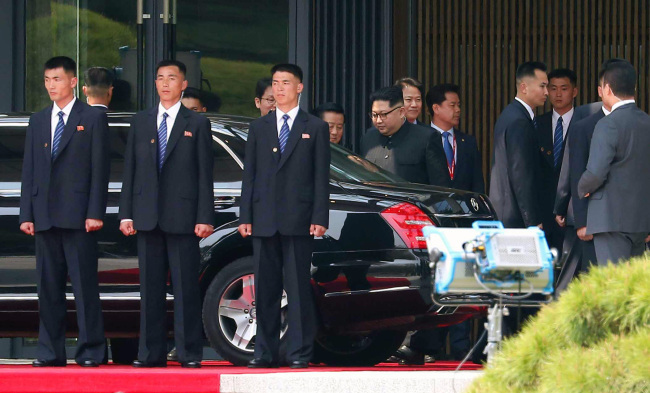 Amid an amicable summit between the two Korean leaders at Panmunjeom on Friday, a herd of stoic North Korean men clad in suits grabbed the attention of viewers watching on television. As Kim Jong-un strode toward the border between the two Koreas, a flock of security guards surrounded the North Korean leader in a V-shaped formation. 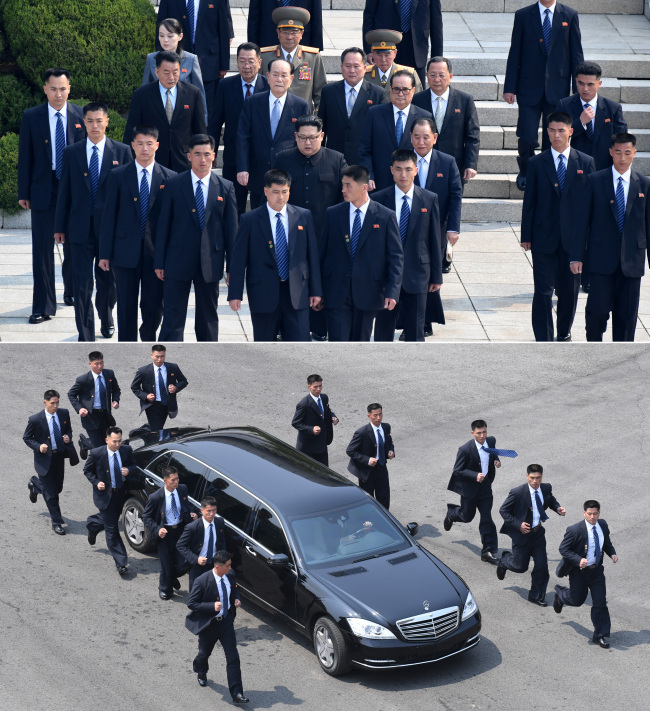 The fourteen tall, suited men scattered when Kim approached South Korean President Moon Jae-in, waiting at the demarcation line. 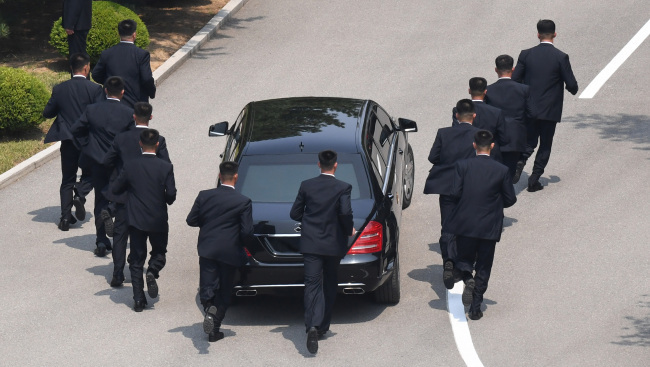 A few hours later, when the morning session of the summit was over and Kim boarded his Mercedes-Benz S-Class limousine to briefly return North for lunch, 12 of the guards returned, circling the vehicle and jogging alongside it. When the car sped up, the guards followed suit and ran in sync with it, five men on each side and two at the back. 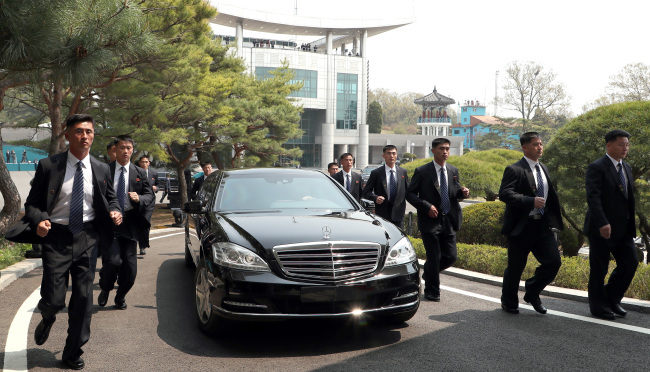 Meticulous care went into security measures Friday, the summit being Kim Jong-un’s first time being exposed for such an extended period to international media. 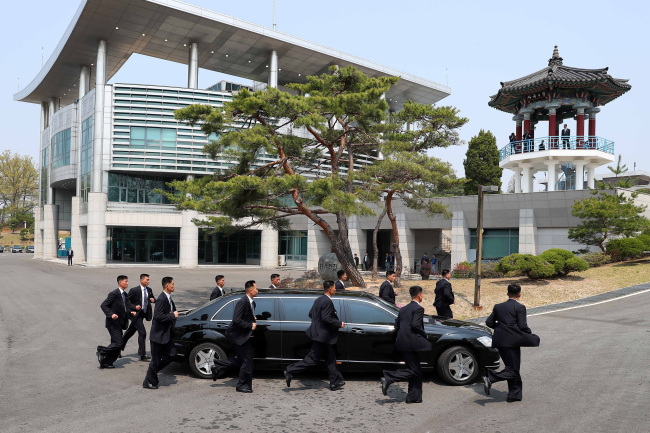 But the prominence of the security guards could also have been a display of power, reports cited a Blue House security official as saying Friday. “The V-shape formation is usually used when going through a crowd of people. But on Friday, it was likely used as a show of North Korea’s meticulousness,” the official told local news. The guards are the most elite soldiers of the North Korean army, reports say. While most North Korean male citizens are obligated to 10 years of military service, Kim’s guards serve for at least 13 years. Years of rigorous training are required to be employed as the leader’s bodyguard. “No special agent would compare to a member of Kim’s security force,” a North Korean defector told local news. Many of the security guards come from elite backgrounds, local reports added. An extensive vetting of each guard’s character and ideology also follows, reports said.